Akhil From Hounslow: Barcelona - More than a club? / Does Cesc need to speak up? Barcelona - More than a club? / Does Cesc need to speak up? So Xavi tells the media at his football camp about how Cesc is ‘suffering’ at Arsenal and Barcelona put it on their official website. Theo Walcott tells Sky Sports News that we want to keep our best players but he'd rather not get involved in other players’ futures because it’s their decision. Arsenal does not put this on their official website. Barcelona say they are more than a club but in my opinion they are not showing the class one would expect. I have been checking back at quotes and trying to get any sort of line from a few journalists I know along with listening to radio shows and without question, Graham Hunter got me the angriest. Hunter says Cesc is ‘determined’ to leave Arsenal. Erm hang on Mr Hunter, if he's so ‘determined’ then surely a transfer request would have come in? Hunter then said one of the reasons why Cesc wants to leave is because the medical team have not dealt with his hamstring injuries well enough. Hunter said Xavi is well within his right to say what he wants and I agree with him, but I did not expect Barcelona to put the quotes on their ‘official’ website. Hunter hinted that if Arsenal do not let Cesc go to Barcelona, he may consider other clubs like Manchester City; now Hunter may be the expert but I cannot agree with that. I have never seen Arsenal putting up quotes from players unless they have spoken directly to the website, to the online TV channel or in a press conference where the club were present. If Cesc is suffering as much as Xavi says he is then perhaps Barcelona need to pay the money Arsenal want. Usually if a buyer wants to buy something, they ask the seller if they are willing to sell and ask the price. The seller then tells them the price and the buyer has to decide if they will meet the asking price, try and negotiate or refuse to buy. Barcelona tried to negotiate and I think Arsenal have dropped their asking price a bit but now comes a time where Barcelona need to decide how serious they are about Cesc Fabregas and either pay up or shut up, rather then posting their players' quotes on their website. Now, this may upset Arsenal fans too but if I am honest with myself and fair, then maybe its time for Cesc Fabregas to do something. I think it may be time for Cesc to speak up; either speak up about wanting to leave OR speak up about Xavi, Valdes and the rest of the Barcelona players' quotes. For over a year, we have had Barcelona players (and Pepe Reina, what it has to do with him, I do not know!) telling us what Cesc Fabregas wants and is feeling and it may have reached boiling point. If Cesc did come out and tell the world he wanted to leave Arsenal, we would see just how desperate Barcelona are to get him and how much they respect him by meeting our asking price and buying him. After all, they did pay millions and millions of pounds/euros to buy Ibra and even threw in Eto. They have or are close to reaching a deal with Sanchez so they clearly have the money. I understand Cesc's close bond with Barcelona and genuinely understand why he wants to re-join Barcelona and would not stand in his way if an offer came in but if it doesn’t, I think Cesc has to understand he is under contract and how Mr Wenger has built his team around him. Before Thierry Henry left, he poured his heart out to Arsenal TV online and wanted to speak directly to supporters to avoid the chance of being mis-quoted and made it crystal clear on why he has to leave Arsenal. 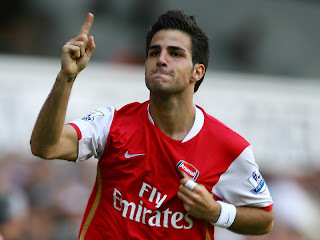 I am not saying the same will work for Cesc but it shows that speaking from the heart can help. If he chooses to do that, but Barcelona still do not meet the asking price then that tells him how much Barcelona want him. It seems like the Barcelona players are using the media to get Arsenal to sell on the cheap and Cesc is refusing to speak up. Cesc Fabregas did choose to come to Arsenal and also agreed to sign a long term contract and even pocketed £3m or so from a loyalty bonus last summer. But, something needs to be done, Arsenal need to know. As usual, well said Akhil. I agree completely! Barca players (and the club) are behaving in a poor, shoddy manner, that sours the admiration that so many of us have for the way they play football. What bugs me even more is the apparent reluctance of Arsenal to complain publically, to the FA and UEFA, about such shameful shenanigans. Think if Arsenal will complain then Barcelona will about the two young players and it will just get even nastier. Thanks Rob, your twitter account didnt come up properly mate. Barcelona know we will never complain to UEFA and will continue to do this. No doubt when they get Cesc they will move onto the next target and start the same thing with that club. "I did not expect Barcelona to put the quotes on their ‘official’ website." When one of their own players -- who happens to be one of the greatest in the world --says something, why on earth should they not post it? "If Cesc is suffering as much as Xavi says he is then perhaps Barcelona need to pay the money Arsenal want." And just why should they? If Cesc is suffering, that doesn't mean that Barça is responsible for it or has an obligation to rescue him at the expense of the other players and their members. Cesc left Barcelona voluntarily. That may have been understandable (there is talk that his family made him do it against his own wishes), but his leaving and his possible retrieval are not the responsibility of FC Barcelona, who are hardly hurting in his position. "No doubt when they get Cesc they will move onto the next target and start the same thing with that club." What on earth are you talking about? Barça is the ONLY club in all of the Spanish League who have signed NO ONE from outside their organization in this whole transfer season. They are hardly the people who "target" stars of other clubs. On a normal day, i would criticize barca's action.... but the day will only become normal when wenger finally decides to pack up his camp and leave our youth teams. the only thing which Barca did wrong wqas to post Xavis words on their site. The players have done nothing wrong. A reporter asks them such questions aqbout Cescs future just so that they get juicy interviews. eg Xavi is asked if cesc would fit in Barca, Xavi says-sure, hes a great player who fits at Barca.We would love for him to play with us. This is a hypothetical wish and nothing more. Wenger and Cesc are to blame. Cesc should never have signed a contract extension as his original contract had a buy back option and Pep has wanted him from the start. roger, you think putting transfer gossip is okay on a official website? Xavi wasnt even speaking to the Barca site, he was speaking at his camp or whatever it is. What other clubs do you see transfer gossip quotes from players on their official site? Arsenal want Gary Cahill, you dont see Jack Wilshere on Arsenal.com saying Gary told me at England camp he wants to come here. That would be disrespectful to Bolton and their supporters. You may think that is acceptable but i wouldnt want my club to sink that low. Also, 'who of their players, who happens to be one of the best in the world'...What has that got to do with it? just because his one of the best in the world he can do what he wants? And i agree with you, Barcelona do not have to responsibility to help 'suffering' Cesc but if they want him as badly as everyone thinks, they can stump up the cash. if not, move on. What is your second comment about? ano, rather then having a go at Wenger, who has done nothing wrong, you should start a campaign to Uefa. There is obviously loop holes in the rules and maybe they should be looked at. Cesc chose to come to Arsenal. He didnt have too. If Barcelona have such high morals, then if Newell's Old Boys want Messi back, will barca give him back for cheap. I wouldnt expect them too! Saarang, if you read my piece again, you will see i said i agreed with Graham Hunter that Xavi is allowed to say what he wants. It was Barcelona putting it on their official website i had a issue with. Now, where is your proof about this medical team? It seems like jumping on the bandwagon, no one seems t0 use that as an excuse before Hunter mentioned it! RvP and Theo have always had injuries, they have not been rushed back every injury they have had. The same medical team got Eduardo and Ramsey playing after all. Cesc chose to come and chose to sign a contract extension and got a loyalty bonus at the same time. Thief's? Will Newell's Old Boys get Messi back then? Newel's old boys if you had taken the time to research actually couldn't pay for the growth hormone injection's that was required for a young Messi to grow, neither River who are one of the powerhouses of Argentine football. Barcelona showed an interest and acted and this is why Messi takes Barcelona to his heart, as there was always was a risk of him not developing. Hardly seen as poaching. Now back to the real issue, In the world of football no one can claim to have high morality, after all club's devise methods to make probability from the expense of us the people, Wenger and 'his' arsenal are no different. Its only Wenger's misplaced theory of ethics that make him sound like a hypocrite, especially when he pockets more annually than his star players. The incompetence of Arsenal medical team in recent years is beyond reasonable by anyone's imagination and you are disillusioned if you feel the recurrences to arsenal injuries are anything less than pathetic, and this is a point that is totally irrelevant to what’s been mentioned in hearsay. How many times did the fans of Arsenal hear that Vermaelen was on his way back from injury? 2 months? 4 months? 2 weeks then oh wait next season. How a top flight club can miss asses injuries especially an achilles injury, when anyone who vaguely knows about achilles injuries can tell you for a competitive footballer that's at least 6 months out from the start. It’s a misconception that these injuries are just bad luck, when your own player Andrey Arshavin in the past has mentioned his distrust at the level of care afforded to him and as a team collectively. Lastly how can such a supposed big club and one that flouts morality continue to let down fans...incoherent views on why arsenal loses games? Continue lack of transfer activity? Closure of the official Arsenal fans forum? Ticket prices for a team that hasn't won in 6 or so years? A club who poaches kids from other teams then plays the victim, all reeks of a club that continues to dissociate itself with reality. yes mate! we all know all that (Messi) Sounds like the Wiki paragraph! But Arsenal did nothing wrong legally. They took advantage of a rule. Same way Barcelona took advantage that Messi's team couldnt afford his treatment etc. Whops deleted the message of my phone by mistake! Vermaelens injury was not a clear cut achilles injury. It was something to do with the Tendon and muscle. Im not an expert so wont pretend i am but i accept complications happen. I admit even i have questions over the medical team because some injuries have been strange. but at the same time the same team got Eduardo and Ramsey playing again so i take a step back from all the theories. You may well be right but Im not an expert and certainly not there behind closed doors at LC. Wiki comment? its just football knowledge, which i thought we all was accustomed to here. And his club Couldn't afford as a gamble if it didn't pay off as hormone treatment as your well aware is not a guaranteed success in a lot of cases. im suprised you dont know that Arsenal was also on track, yet i didnt see them take the gamble? neither real madrid and a whole host of clubs. This is just glass houses, if you really wanted to make a point surley pedro would have sufficed? The point being? Barcelona in a world of non morality dont have to play to the rules set by Arsenal or anyone just like Arsenal. exactly. Arsenal do not have to sell at a cut price either. completely if Arsenal put a figure down clubs must accept that. Yet It puzzles me that Wenger would allow nasri to go for free and not accept a fee thats been flagged around. This is madness on his part and the board in general, when they have been selling rather than investing in quality. for instance is gibbs really the replacement for clichy, not suggesting the latter is great by any stretch of the imagination but i cant call gibbs a full back for the life of me. No other major club has so many issues up in the air , which relates to the themes of my comments previously that Wenger and the board have lost a lot of trust, and are becoming more and more ignorant to the issues fans such as yourself and millions are addressing day to day. I agree with you re Nasri. Makes no financial sense in keeping him. Unless AW thinks he can convince him to stay between now and end of next season but its a massive risk. Still think there will be some activity because defensively we are weaker then last year! Time will tell. Fair play anyway mate. Thanks for commenting. The reason Cesc wouldn't hand in a transfer request is because he loves the club too much. He's not the type of guy to do that or go on strike and refuse to play if he doesn't get sold this summer. He's got to much respect for AW and Arsenal. Barca know that they don't have to pay crazy money for him because its not like he can go any where else or begin a bidding war with the likes of Man City, Chelsea Madrid because if he was willing to go to any club you know some like Madrid would pay £50-55m for him. And can we afford to have Cesc here if his hearts not in it. You can't have your captain not fully focused and committed, not good for the squad he has to go. I agree that £35m is way too low its ridiculous, and if they want him pay up. IMO apart from Xavi, Iniesta, & Sneijder, there is no better midfielder in the world in that role and i reiterate the fact he just turned 24! He's Arsenal captain with 4 yrs remaining on his contract, is proven at every footballing level possible. He has not even at his peak yet. They value players like Villa at £35-40m he's 29. Players like Sanchez who are unproven at the very top level fair enough your paying for his ability and potential but there willing to pay £37.7 m for him. Players prices have increased drastically. They forget they payed £50 odd million for players like Ibrahimovic & Eto was involved in the deal, yet they don't want to pay more then £35 m for Cesc. Its a bargaining tool they trying to make Cesc think hold on if AFC do not except it then his chance to play for FCB is gone. The fact is if he did not leave they would still pursue him next summer, They have tried to make Cesc go public and reiterate his desire to play for Barca and tried everything possible to publicly pursue him.Not only would we loose our best player & Captain but we loose the man the team is built around yet they Value him at £35m? But unfortunately foreigners don't have loyalty eventually most of them will want to return back home ect. Even the other week Hector Bellerin who is 16 we just signed for Barcelona's La Masia, the day he signed he admitted that one day in the future he would like to return to Barca. IF this teaches us anything it's dont poach there youngsters, because you spend all that time and effort developing them, integrating them within your squad and before they hit their peak they want to return home. But I think that Arsenal may sell at a lower price then they want because otherwise like I said he won't go anywhere else your stuck with a player who happens to be your captain who's not fully focused and minds elsewhere. And letting Nasri walk away for free next yr is absolutely ridiculous. I think he wants to leave if he was going to sign his contract it would of been done now. How AFC have allowed key players to run their contract down to within a yr of expiring shows how clueless the board are. If he wants to leave as much as i'd hate it sell him. Get £25m and re invest it. or let him walk away next summer for free to UTD, Chelsea or City? CRAZY! Do apologize for the ridiculously long comment lol! Agree with most you said Rik. I agree Cesc loves and respects the club and manager alot BUT Xavi has spoken out a number of times, Cesc could tell his mates to maybe pipe it down but he seems like he hasn't done that (or his mates are not listening). Respect works both ways, Cesc hasn't spoken out which is fair but his not exactly stopped his Spanish barca mates from speaking out. It should be left to both clubs to sort out, not players coming out in the media and barcelona putting it on their official website. Apart from that, i agree with everything. The Uefa rule as you said is not Arsenals problem. I guess if Hector develops into a good player and we get money for him then its a plus but maybe the idea is not to be too dependable on him. Cesc though is certainly worth the money because of his age and as you said, hasnt even reached his peak yet. Hi Akhil - can you let me know your email address so I can invite you to blog on the FTBpro network which launches in a couple of weeks. We are already 400,000 strong on facebook and growing rapidly so have plenty of traffic to send to your blog.